Click here: listen to some of the first UT cheers, recorded at “The BigYell” in 2007. 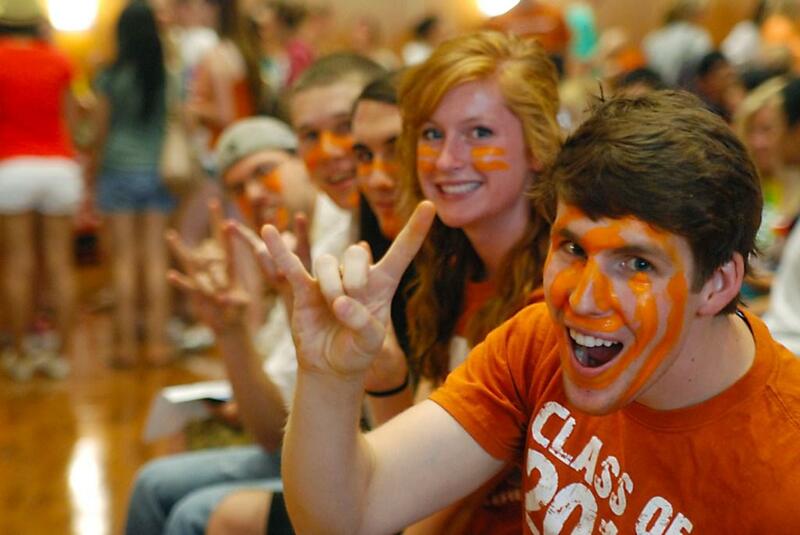 Before Bevo, before Texas teams were known as “Longhorns,” before orange and white were named the official university colors, what did UT students yell? In the 1890s, when intercollegiate sports was new to the Forty Acres, groups of dedicated rooters – known as “rootatorial committees” – often created yells and songs for upcoming games. (History of the first UT yell is here.) Most of these didn’t last, but the printed sheets of the yells, as well as old yell books, are still preserved in the UT Archives. Occasionally I stumbled across them and made copies, or acquired them on EBay or at local book and paper shows. At some point, I wondered if it might be possible to record, save, and post some of the old yells online for others to hear. Certainly, it would require a group of UT students to do the yelling. And, well, probably pizza . . . 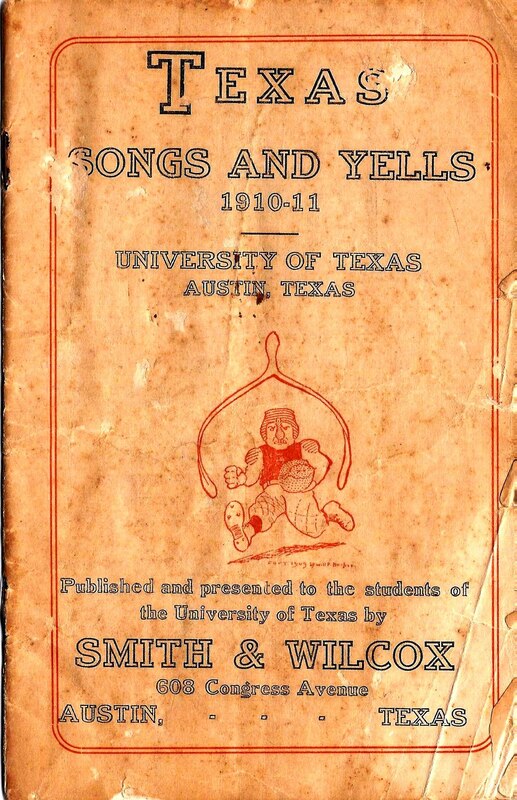 Above left: The 1910-11 UT song and yell book. Printed from 1899 through the 1930s, the books were particularly useful for freshmen, who would bring them to football rallies. 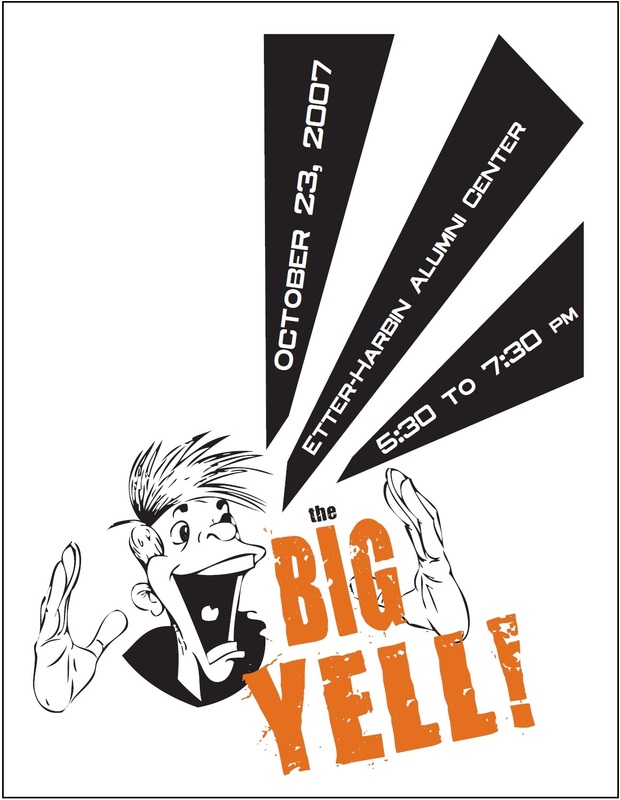 On October 23, 2007, the UT Heritage Society and the student-led Spirit and Traditions Council, both then sponsored by the Texas Exes, hosted the “Big Yell” in the banquet hall of the alumni center. More than 225 alumni and students arrived for a pre-Yell pizza party, downed a staggering 75 pizzas, and then gathered to rehearse and record a series of old University yells created from the 1890s through the 1900s that hadn’t been heard on the campus in more than 80 years. Along the way, the group heard some UT history, shared fun facts, won door prizes, and listened to special guest Harley Clark, the former head cheerleader who introduced the “Hook ’em Horns” hand sign at a 1955 football rally in Gregory Gym. Yell books, similar to those published in the 1900s, were distributed to everyone. Above: The 2007 Big Yell held was held in the alumni center. And what of the Big Yell? Everyone had so much fun, another program was held the following year. Since the north end of Darrell K Royal – Texas memorial Stadium was being rebuilt, the 2008 Big Yell took on old Clark Field – UT’s first athletic field – as a theme. Bleachers were brought in to the banquet hall and the crowd learned about early football plays, the story of Bevo, and other football-related traditions. 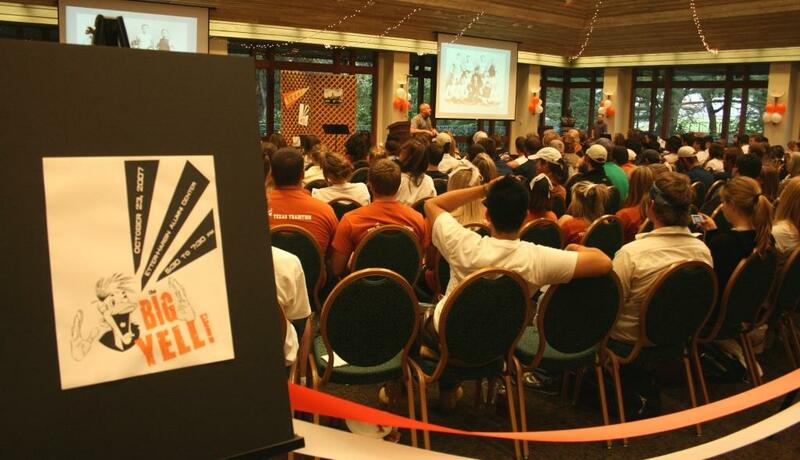 The 2009 and 2010 Big Yells were similar to the first year, but instead of recording, an emphasis was placed on teaching new students UT history and traditions. Attendance continued to grow. In 2011, at the suggestion of the students, the event was moved to the ballroom of the new Student Activities Center (photo at right) and scheduled to be on the afternoon of the first day of class. It was standing-room-only and was featured on the front page of The Daily Texan the next day. The following year, UT’s athletics department volunteered its support, and the program was moved to the stadium to handle the crowd. Above: the 2012 Big Yell moved to the football stadium. 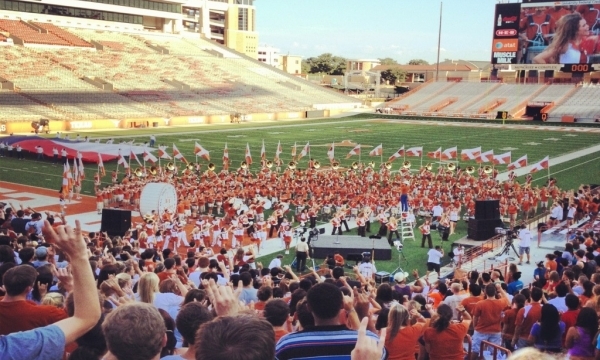 Today, the Big Yell has evolved into the “Texas Kick-off Rally,” and includes the Longhorn Band, cheerleaders, APO’s Texas Flag, Bevo, the Texas Cowboys’ Ol’ Smokey cannon, and the head football coach, and features a post-rally group photo of the freshman class. Listen to the 2007 “Big Yell” recordings here. Or look under the “Audio” menu of the UT History Corner.